I make these all the time. They’re made with just fruit, nuts and coconut oil so they’re a healthy treat but they are also sweet and have a lovely flavour. So that explains why I make them all the time – even when I’m not being healthy. This is the abitmoreveg recipe that I make most often. I should really call these soft orange and raisins vegan cookies. But that isn’t what I called them so I’m going to leave it as it is. I called these “soft” because they are not in anyway crunchy like your normal cookie, these are like thin crisply baked moist cake. They’re sweet – good as a treat even when you’re not eating healthily. I love them. After looking at the recent photos on this post I decided to add in more ground almond into the next couple of batches that I made – they’re great, but they are more filling – and crispier. I’m finding the whole going gluten-free thing quite difficult. I did decide to give up all grains and legumes for a few months also. I have had a couple of slips. The thing I miss most is actually wholemeal soda bread – there is just no good substitute for wheat. (Of the recipes I have here for it I actually prefer the vegan wholemeal scones made into a loaf.) Really miss it in the mornings. 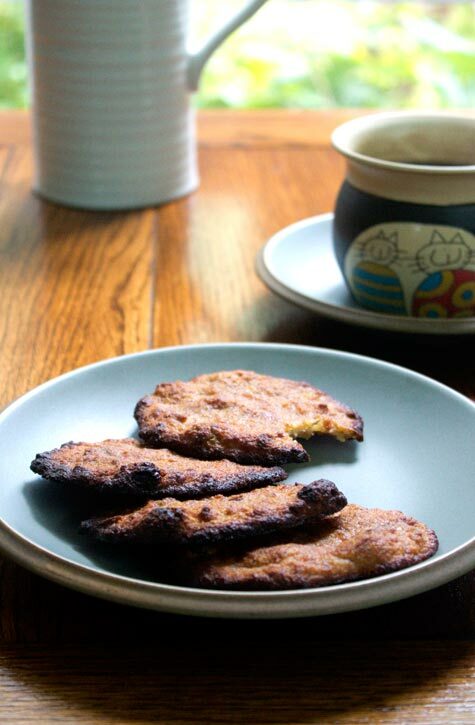 I also miss biscuits – or cookies if you prefer. I only have them once in a while but homemade cookies are such a treat. Who cares if they’re healthy? They’re just so sweet and nice. And I have a couple of cookie recipes I – used to – love to make. The first one isn’t mine, it’s one I found it online. The second cookie recipe was the chocolate gingernuts recipe. I’m afraid although I used to make them all the time (never put the nuts in them though apart from that first time) I’m not sure if the old recipe is totally correct – I think it might be right but I don’t think I added the egg normally… I’m sorry I can’t be sure and I won’t be making them again as they’re not gluten-free. Dammit. 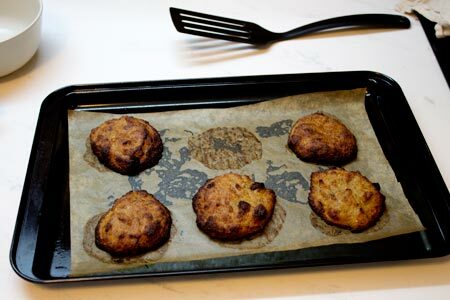 I was looking for a homemade version of those fruit shortcake biscuits – you know the ones, they’re thin, have dark raisins in them, a light dusting of caster sugar, usually the packet costs less than 50¢. I came across a recipe for Easter biscuits or possibly cookies. 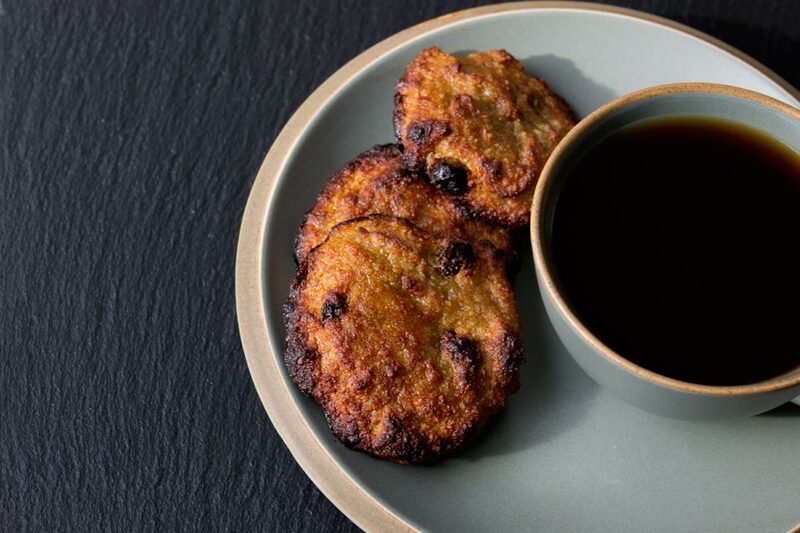 It was so simple and it made just 6 – 8 cookies, took just a few minutes to put together and baked in less than 12 minutes. I’m sorry to say that while I took down the recipe on paper, I didn’t keep a note of the website and I have been unable to find it now to link to – if this sounds like your recipes it’s great, thank you and I’m sorry I didn’t keep a note of the link. Easter Biscuits recipes: 75g plain flour, 25g caster sugar, 50g melted butter, some juicy raisins, some orange and lemon zest and I used to add a tablespoon of whole milk. 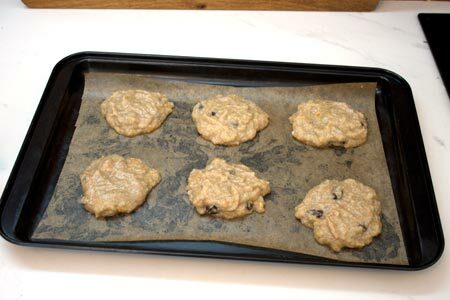 Mix it all together till you have a ball of cookie dough, cover it in greased cling film and leave in the fridge for just about 10 – 15 minutes, just so as it’s easier to roll. Roll it out till its quite thin and then cut it up into your cookies, it will make between 6 – 8 cookies. Bake in hot oven (about 210 C) for about 10 minutes or until the side of the cookies have turned golden brown. Allow to cool. Serve with coffee. Quick and simple treat. But they contain gluten which is why they are not the real recipe I’m posting here. I add a little more orange juice to the cookies I make today. So that’s why the ones in these old photos are a little bit thicker. I came up with these vegan soft fruit cookies while trying the get some sort of gluten-free and healthy (so no added sugar) treat. Are they like Easter Biscuits? 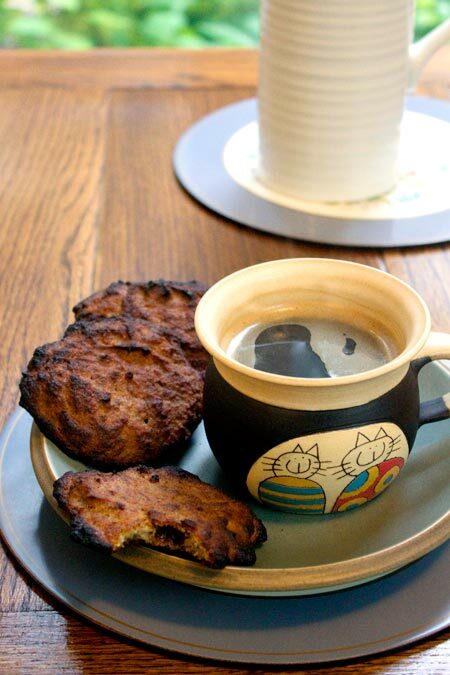 Not really no, but they are really yumm – and way healthier. I add orange zest to them so they sort of remind me of Easter Biscuits. 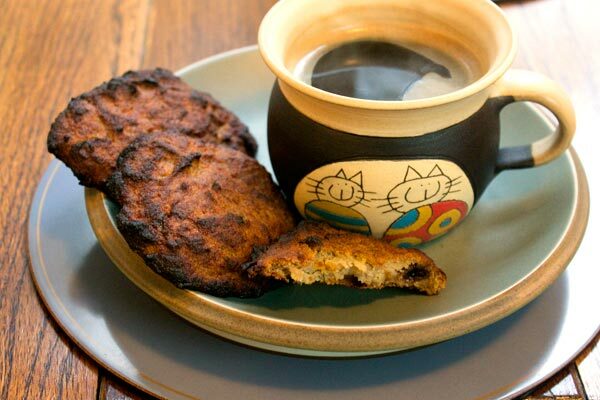 The downside to them is that they take about 40 minutes to bake, so not as quick a treat as the biscuits. Also they do not have the crunch of biscuits. It’s really just small circles of a cake-like mixture baked so they have a roasted sort of crispiness to them and they are soft (sort-of) inside. Personally I love these. If you’re looking for a healthy, gluten-free (and vegan) treat give them a go. If you prefer lemon to orange you can use lemon instead, just add less of the juice. With refined-sugar-free recipes how sweet they taste before baking is a very good indication of how sweet they will taste once cooked, so make sure that you like the taste before you put them in the oven. I had made these twice before posting first time with orange the second time with lemon but to be honest in all the times I’ve made them since posting I’ve only made them with orange. Orange zest, ripe bananas, ground almonds, coconut oil and fresh orange juice. Preheat the oven to 160 C. You can melt the coconut oil in the oven as it heats. Place the orange zest on a large plate. 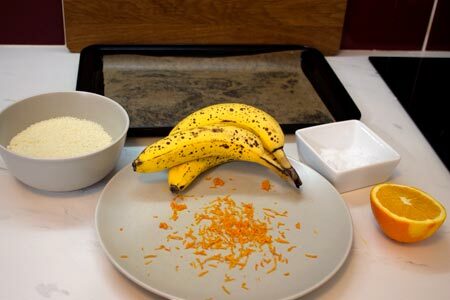 Peel the bananas and mash them into the orange zest. Pour half the orange juice over and mix it in. Add in the ground almonds and mix in well. Pour over the melted coconut oil and mix in well also. 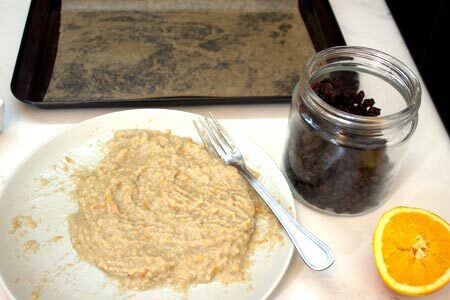 Pour over the rest of the orange juice, mix in and add a good fistful of raisins. Line a greased baking tray with greased baking paper. Spoon out about a tablespoon and a half of the mixture onto to baking sheet, repeat till the mixture is all on the baking sheet – should have six. The cookies wont spread while cooking, they will have whatever shape they had before baking. Cook in the over for 40 minutes or until they are well roasted. Add some raisins to the mashed fruit and nuts. You must line the baking tin with greased baking paper. They’re easy to get off then but this is a really necessary step. 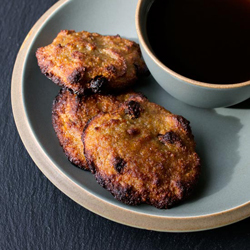 The result isn’t like your typical cookie, it’s softer with a roasted crispiness on the outside. Great with your mid-morning or midday coffee. I make these all the time. And they’re quite the healthy treat; no refined sugar, just a mix of fruit, nuts and coconut oil, so why not? If you decided to go with the chunkier version, if you let these ones cool completely – I rarely do – they are properly crispy on the outside but still soft on the inside. Also, they are much more filling.